What a beautiful slideshow! 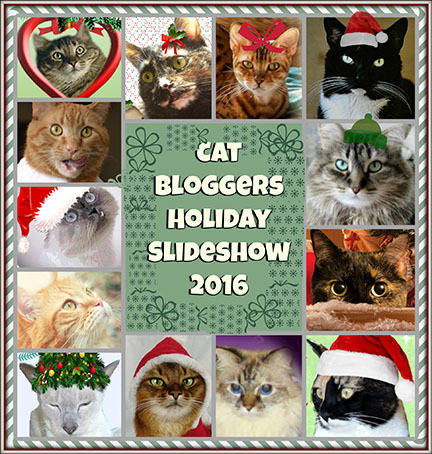 Thank you so much for creating this... it's so wonderful to see so many cats from around the world! Merry Christmas and Happy Holidays from all of us at the Townhouse. Absolutely beautiful! Thank you so much for all the work you put into this. We loved seeing so many of our friends in this gorgeous video. We wish you a very Merry Christmas and a happy, healthy, and safe New Year! Beautiful. You did a great job! You did an awesome job! It was so cool to see so many of our pals! That was such a wonderful slideshow. So much fun to watch. Thanks for putting this together! Merry Christmas! Aaawww, it could not have been sweeter or more special. Each show you do becomes lovelier ... just a wonderful production! We so enjoyed having Summer in it with her adorable hat and great confidence! Waffles and Katie were a blast and greatly enhanced the show! We loved your furry and bright card! Zuzu looked great with his green ball! It was wonderful to see you, Smokey, in Random Musings! Thank You! Hope you guys will be in a future one! Thank U so much for that festive Christmas card! Tinker, Bridge, Anastasia & Chopin were a a great addition! Thank U Ann. We loved your festive card! And for all your help facilitating! So much love, thought, and effort went into this! Thank you so much for creating this for us to enjoy! Each card was so wonderfully unique!! You did a fantastic job putting this together. I love it! You did a great job. We loved watching it. Another beautiful slideshow Carol! Thank you so much:D We really loved seeing all our friends! We wanted to wish you and the girls a most Merry Christmas! May it be filled with love and peace. wonderful slideshow! It's good to be reminded that there are so many great blogs out there! Paws up! It is a great slideshow...thank you for all your efforts putting it together. We loved seeing everybuddy! Thank you so much for doing this! The video is wonderful and so fun to see so many cats & dogs! What an amazing card of Dexter, Olive and Sophie peering out, the trendy trio! It was lovely. Thank you. Thank U Orange boyfriend. what would a slideshow be with YOU, our love? Hi and thank you! Your lovely card really enhanced the show. Warm regards to all your photogenic critters and a special hug to my great love, "W" !!! Thank U! Hopefully you'll join us for future shows! We enjoy your blog. And thanks to YOU for all the encouragement before-hand. It was great seeing Zorro and Pixie join us. That is a really lovely compliment, Caren. Thank YOU for letting Cody and Dakota join us!! Hahaha you certainly understand what goes behind it and I so appreciate that acknowledgement! We sure did enjoy your artwork of Shoko and Kali! Beautiful slide show, thank you for all your hard work. Merry Christmas and a happy, healthy 2017! What a beautiful slideshow! I'm so mad at myself. I forgot to send our card in. There's always next year! Love it, love it, love it! And thank you for including us :) Have a very merry Christmas! We are headed over to You Tube to watch now. Thank you so much for putting this together! Merry Christmas Eve, friends! Loved the slide show! Thank you for this nice present. Purrfect in every way! Thank you for doing this for all of us! A very merry Christmas to you! Lots of kitty kisses sent your way. Merry Christmas! WAS that ever spectacular!! Thank you!! Peaches and Paprika the slide show was truly epically epic, mew guys did a stellar job and we are so proud and grateful fur being included, thank mew both so much!!! We finally got to see the slideshow and you have done a wonderful job on putting it together. So pretty. So many beautiful/handsome cats (and dogs) involved and so much talent in making cards. Thanks! We love slide show! Katie Mom thinks its like the bestest slide show ever this years! You really put lots of work to make this show specatac-purrler! We kept Katie the Mom sooo busy fur the last several days...furevers that her am now getting around to wishing everfurry da Meowest of Holidays, we thinks Christmas should last eight days til Mew Years like Hanukkah!